As the nation settles into the celebrative mood of the festive season, Tanoa Tusitala decided to honor their staff for a job well done throughout the year last week. Standout work was recognized and the staff members were given a well-deserved break while they celebrated with drinks, laughter and food galore. 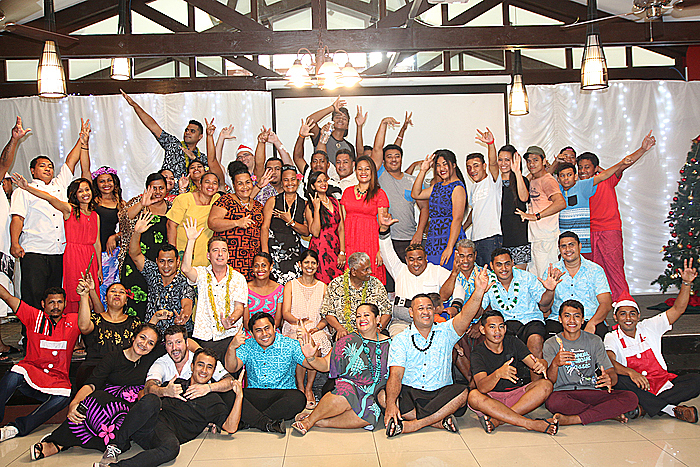 Tanoa Tusitala Samoa’s General Manager, Jason Strickland, said although they celebrate the staff four times a year, this celebration was even bigger because it’s the end of the year. It was also a small farewell for Mr. Strickland as he prepares to leave for Tonga to begin a new chapter of his life. “Four times a year we celebrate the success of our people, our staff who have stood out over the last quarter,” he told the Sunday Samoan. And with Tanoa’s Chairman, Mr. Y.P Reddy, joining in on the celebration, it was all the more reason to turn up the music and keep the drinks flowing. “It’s really fantastic, our chairman Mr. Reddy is here and also one of directors and his daughter have flown over from New Zealand to celebrate the success of the staff,” Mr. Strickland said. Asked about how they planned to celebrate and the first thing on Mr. Strickland’s list was of course, food. “In Samoa, it has to be food,” he said. And Mr. Strickland assured that there was a lot of ‘responsible drinking.’.